In past studies of the effect of environment and social settings upon the cognitive development of deaf children, results frequently were confounded by conflicting conclusions related to the participants' varying degrees of hearing loss. 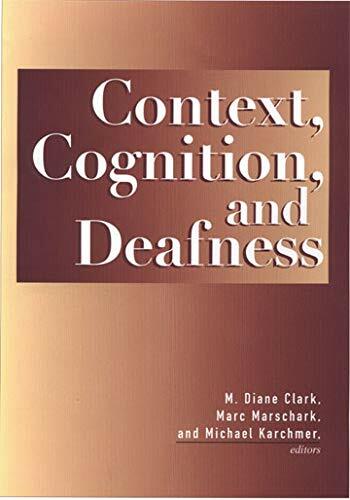 Context, Cognition, and Deafness: An Introduction takes an interdisciplinary approach that clarifies these disparate findings by analyzing many methodologies. Editors M. Diane Clark, Marc Marschark, and Michael Karchmer, widely respected scholars in their own right, have assembled work by a varying cast of renowned researchers to elucidate the effects of family, peers, and schools on deaf children. To integrate the often contrasting approaches of clinical and cultural researchers, this sharply focused volume has called upon experts in anthropology, psychology, linguistics, basic visual sensory processes, education, cognition, and neurophysiology to share complementary observations. One of William C. Stokoe's last contributions, "Deafness, Cognition, and Language" leads fluidly into Jeffery P. Braden's analysis of clinical assessments of deaf people's cognitive abilities. Margaret Wilson expands on the impact of sign language expertise on visual perception. Context, Cognition, and Deafness also shows that theory can intersect practice, as displayed by editor Marschark and Jennifer Lukomski in their research on literacy, cognition, and education. Amy R. Lederberg and Patricia E. Spencer have combined sequential designs in their study of vocabulary learning. Ethan Remmel, Jeffrey Bettgen, and Amy Weinberg explore the theory of mind development. The emotional development of deaf children also receives detailed consideration by Colin D. Gray, Judith A.Hosie, Phil A. Russell, and Ellen Ormel. Kathryn P. Meadow-Orlans delineates her perspective on the coming of age of deaf children in relation to their education and development. Marschark concludes with insightful impressions on the future of theory and application, an appropriate close to this exceptional, coherent volume.